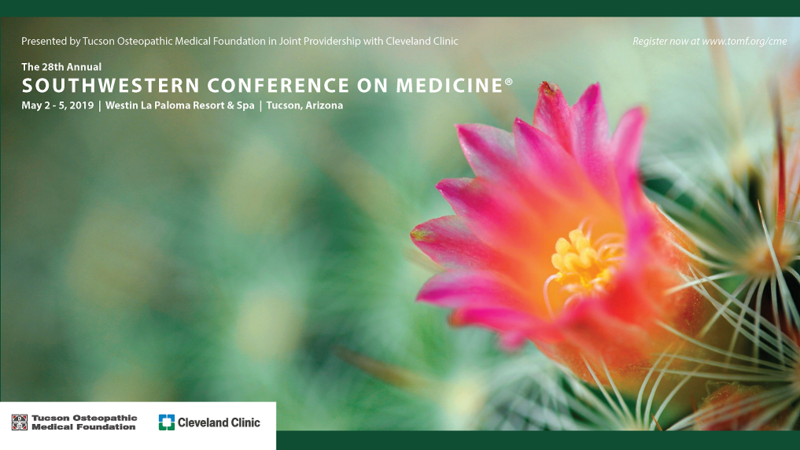 The 28th Annual Southwestern Conference on Medicine is proudly presented by Tucson Osteopathic Medical Foundation and Cleveland Clinic, and will be held May 2 - 5, 2019 at The Westin La Paloma Resort & Spa in Tucson, Arizona. The Brochure is here! View the most up-to-date Agenda here! Click here to register online today! Download the printable registration form here. The room block closes soon! Click here to reserve a room at the beautiful Westin La Paloma Resort & Spa. A special rate of $209.00 per night, single or double occupancy, plus tax is being offered to Southwestern Conference participants. The Resort Fee has been waived. Rooms may be reserved at this special rate until April 12 or until the Foundation's room block is filled. If you have issues reserving a room, please email reservations@westinlapaloma.com and they will be happy to assist. A limited number of exhibit opportunities are still available! Click here to view the Exhibitor Prospectus or call (520) 299-4545 for more information. The Southwestern Conference on Medicine® is an annual event designed to bridge practice gaps between primary care providers' current knowledge, practice performance, patient outcomes and the ever evolving standards of care in modern medicine. Primary care providers, internal medicine specialists, Physician Assistants, Nurse Practitioners and all other physician specialties are minimally exposed to the continual influx of new research data, recent studies and emerging disease states and lack expert mentoring to be able to improve competency, practice performance and patient outcomes. By providing the most current evidence-based findings, studies and technological advances, the Conference will allow the participants to advise their patients to improve care, outcomes and health. The knowledge, competence and performance gaps of this educational activity were developed from data collected from past Conference participants and outcomes measurement tools, the Planning Committee's perceptions of needed improvements in primary care diagnosis and treatments, national and local statistics and review of current trends in technology and medical literature. Participants will be able to: recognize, analyze and assess current issues in primary care and internal medicine; identify and utilize new and updated treatment methods; review new guidelines for treatment of a number of disease states and disorders; discuss cases regarding new treatment options and technological advances; utilize the most up-to-date clinical and scientific information in practice; examine case studies, patient outcomes, research results and best practice guidelines for application in clinical practice; appropriately evaluate patients for referral. Tucson Osteopathic Medical Foundation (TOMF) is accredited by the American Osteopathic Association (AOA) to sponsor continuing medical education for physicians. TOMF designates this program for a maximum of 30 AOA Category 1A credits and will report CME and specialty credits commensurate with the extent of the physician's participation in this activity. Three additional AOA Category 1A credits may be earned by DOs who complete an online post-conference outcomes assessment. In order to obtain any credit, all participants must complete the Conference evaluation and CME attestation at the end of the meeting. This activity has been planned and implemented in accordance with the accreditation requirements and policies of the Accreditation Council for Continuing Medical Education (ACCME) through the joint providership of The Cleveland Clinic Foundation Center for Continuing Education and Tucson Osteopathic Medical Foundation. The Cleveland Clinic Foundation Center for Continuing Education is accredited by the ACCME to provide continuing medical education for physicians. The Cleveland Clinic Foundation Center for Continuing Education designates this live activity for a maximum of 30.0 AMA PRA Category 1 CreditsTM. Physicians should claim only the credit commensurate with the extent of their participation in the activity. This Live activity, the 28th Annual Southwestern Conference on Medicine, with a beginning date of 05/02/2019, has been reviewed and is acceptable for up to 30.00 Prescribed credits by the American Academy of Family Physicians. Physicians should claim only the credit commensurate with the extent of their participation in the activity. This activity has been reviewed by the AAPA Review Panel and is compliant with AAPA CME Criteria. This activity is designated for 30.00 AAPA Category 1 CME credits. PAs should only claim credit commensurate with the extent of their participation. This activity was planned in accordance with AAPA CME Standards for Live Programs and for Commercial Support of Live Programs. Save the date for the 29th Annual Southwestern Conference on Medicine, April 23-26, 2020 at Westin La Paloma Resort & Spa, Tucson, AZ.